B Series Build - King Motorsports Unlimited, Inc. The motor that started it all. 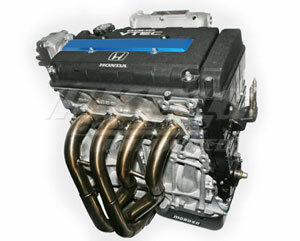 The Honda B-Series is, by far, the most popular engine for swaps in the Honda/Acura scene. Here at King, we've done literally hundreds of B Series swaps over the years. We have unsurpassed knowledge experience and proven results building and tuning these motors. Whether street, road course or strip, King's B Series builds have proven not only fast, but incredibly reliable. The LS-VTEC Hybrid, or Frankenstein motor, combines the best of two different Honda powerplants while maintaining OEM parts and reliability. The LS-VTEC takes its name from the most commonly used parts; the 1.8 litre shortblock from an Integra LS (or GS/RS), and a VTEC head from an Integra Type R/GSR, Civic Si or Del Sol VTEC. Substantial power and torque are easily obtainable through exhaust, intake and cams. Add to the mix the key ingredients of a good tuning solution along with King's expert tuners and you've got the recipe for some serious all-motor power! As for forced induction, numbers of 300 to 500+ WHP are easily attainable. At King, we offer 3 basic types of builds, but almost all of our builds combine aspects of all three. For details on our build process and pricing, visit our Engine Build Process Overview.